“Ninjin shirishiri ki” is a cooking utensil that’ not only used only in Okinawa, but people from other prefectures of Japan can’t even understand what Ninjin shirishiri ki actually is. Ninjin means “a carrot” and shirishiri is Okinawan dialect meaning “to slice.” Actually, Ninjin shirishiri is a well-known Okinawan dish, and as ki means equipment Ninjin shirishiri ki is an utensil used for preparing the dish. 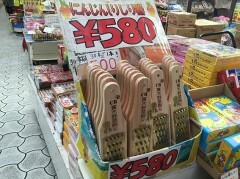 It’s said that every family on Okinawa has at least one Ninjin shirishiri ki. You can get one at any supermarket here.